The oldest Major of them all comes back to Muirfield after an absence of 11 years. One of the most testing venues on the Open Championship Rota will again provide a stern test of links golf over 4 rounds in East Lothian, Scotland. The “Champion Golfer of the Year” winning at Muirfield has always been a stellar ball-striker past winners being Faldo (twice), Els, Watson, Trevino and Nicklaus among others. I expect a similar type of player to claim The Open Championship on what will hopefully be a sunny Sunday in July this year. Course form really comes into it when considering a potential Open Champion, case in point was Tom Watson at Turnberry in 2009. 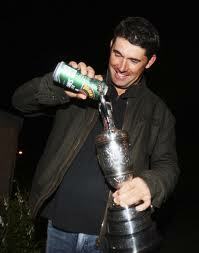 That is why my main contenders for the 2013 Open Championship are Padraig Harrington and Ernie Els. Honourable mention, and this is a rare one for me, goes to Tiger Woods and maybe also to some unexpected (sometimes random) American who tends to somehow contend every year in the Open……..lets go with Rickie Fowler. 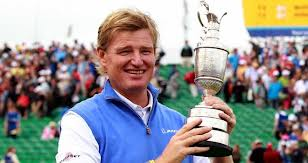 For those of you young enough to remember, Ernie was the only golfer to shoot all rounds in the 60s at Muirfield in the 1992 Open Championship, won by Nick Faldo. 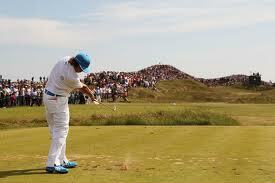 He then went onto win The Open here in 2002 in a playoff with Thomas Levet. That, allied with the fact that he is defending champion, is proof enough for me that he will contend this time around. He has not shown fantastic form yet but there is plenty time for that, he did not show much going into The Open last year either and we all know what happened. Padraig Harrington is one of finest Open Championship golfers of his generation, along with Tiger Woods and Ernie of course, and I expect a huge performance from the Irishman again at Muirfield. He was one bad tee shot away from making the playoff in 2002 and with his form starting to come back he could well become a serious Major contender once more. His run of 3 Majors in 13 months looks like quite a feat now compared to all the first time winners since then and do not be surprised if “Paddy” is again hoisting the Claret Jug in July, this time around the Harrington family might not be putting ladybirds in it though! 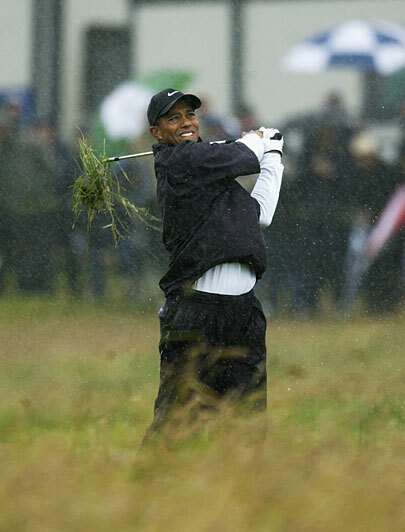 Tiger did not have the best of times at Muirfield in 2002, losing his opening tee shot into the right rough at approximately 9am on that Thursday in July 11 years ago. It was an iconic shot as he was still using his Titleist 975D driver at the time although signed up for Nike several years before, and many the amateur golfer did have an early morning chuckle at him looking for his ball in the long rough down the right of the 1st fairway at Muirfield. He has shown he can put together a strategy to win an Open Championship though, not hitting a bunker on his way to victory at St Andrews and hitting driver only 3 or 4 times en route to his Hoylake win being cases in point here. I would still point to his long game being the most worrying part of his game, still, and his clutch putting ain’t what is used to be. Rickie Fowler looks like one of those American players that loves playing in The Open Championship. He is turning into one of the best shotmakers in the game and I would look to him for a Top-5 finish again. Had it not been for the worst of the weather affecting his run at the 2011 Open during the 3rd Round we might have been talking about his first Major win and not Darren Clarke’s Open triumph. Fowler played wonderfully well during that tournament and his putting under pressure looks solid, the amazing finish conjured up during his Ryder Cup singles match with Edoardo Molinari in 2010 at Celtic Manor provides the proof here. A few quid on Rickie could be well spent although I’m sure the Honourable Company of Edinburgh Golfers might prefer if he changed into something less, well orange, if he was to accept the Claret Jug after 72 holes at Muirfield in July! So, those are my early thoughts on The Open Championship. Out of the 4 contenders I’ve mentioned I would pick Padraig Harrington to claim his Third Open title, and Fourth Major, with Ernie being my pick to lead after Round 1. Expect plenty of surprises during the week at Muirfield but these 4 great golfers should be right there coming down the stretch on Open Championship Sunday in Scotland.